Friday November 16th 1877. We did a lot of cake baking this forenoon and in the afternoon we girls both went over to see Maggie Lathrop who has been sick for some time. We came home before supper. Hatt went to society at night. I practiced an hour and then cut and sewed carpet rags. Saturday November 17th 1877. I helped with the work all the forenoon. In the afternoon I went to town. I had a picture taken for Pete. I went down to Mygatts where I stayed till after supper. Flora and Mr Chapman came home with me. Winnie was over and Hatt and Pottle took her home. I was tired and went to bed early. 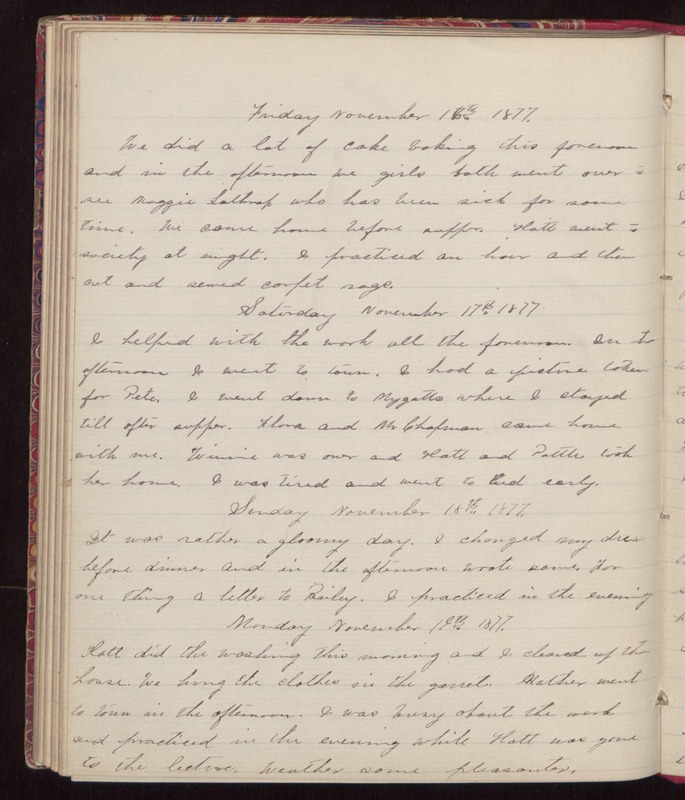 Sunday November 18th 1877. It was rather a gloomy day. I changed my dress before dinner and in the afternoon wrote some. For one thing a letter to Bailey. I practiced in the evening. Monday November 19th 1877. Hatt did the washing this morning and I cleaned up the house. We hung the clothes in the garret. Mother went to town in the afternoon. I was busy about the work and practiced in the evening while Hatt was gone to the lecture. Weather some pleasanter.